Pureed squash and sweet potatoes are some of the handiest ingredients to have around your kitchen in the fall and winter months. The puree is great in mac and cheese, like this butternut squash version or this sweet potato version. Purees squash can serve as a great filling for enchiladas or even use as an enchilada sauce. 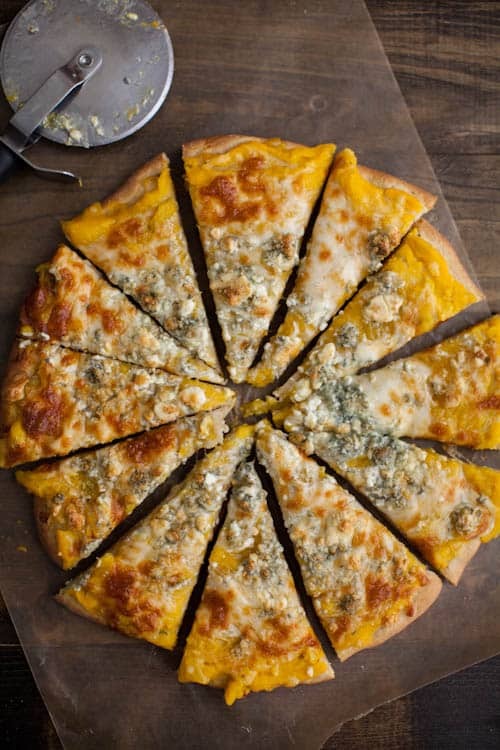 And, as in this butternut squash pizza, the puree serves in place of the more traditional tomato sauce. 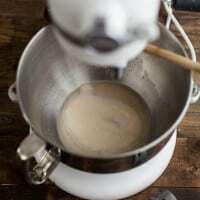 In a bowl of a stand mixer, combine the water, yeast, and honey- stir with a wooden spoon until yeast is dissolved. Let sit until yeast begins to activate, 5-10 minutes. Once yeast is ready, add in oil, salt, and 1 cup of flour. Turn your mixer on low with the dough hook on and let mix, scrapping down the sides as needed. From here on out, add 2-4 tablespoons of flour at a time, letting the dough mix for a bit until adding more flour. When the dough starts to come together, continue to let the mixer run for 1-2 minutes and adding more flour until your dough has pulled away from the sides of the mixer. Remove from the mixer and place in a warm spot. Brush with oil and let rise for 1 hour. In a food processor, pulse garlic and rosemary until broken into small pieces. Add the butternut squash and puree until smooth. Once your dough has double in size, preheat your oven to 500˚. Return to your dough and punch it down. Let rise for 20 more minutes. Roll the dough out onto a surface covered in cornmeal (I used a large wood cutting board put some of you may have a pizza peel.) Roll it out to the size of your pizza stone. 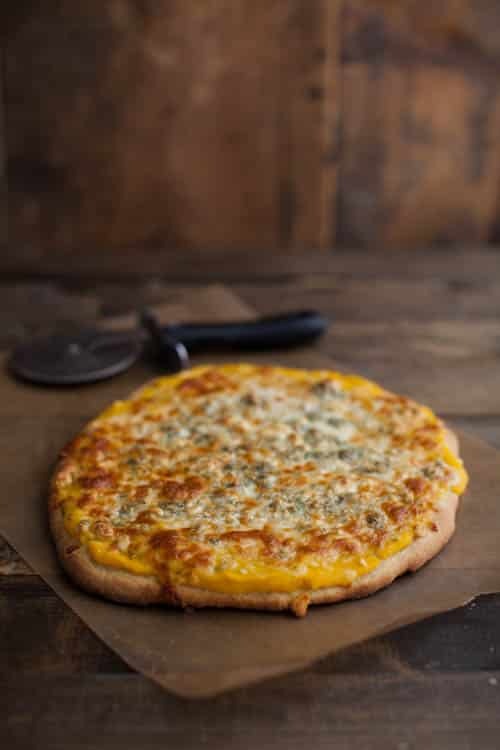 Spread the squash puree over the pizza dough and top with mozzarella cheese and blue cheese. Carefully transfer pizza to the stone and bake until cheese is bubbling and crust is golden, 12-15 minutes. Let cool for 5 minutes before slicing. To make puree: slice a butternut squash in half, remove the seeds, and place cut side down in a roasting pan. Fill with a 1/4″ of water and roast butternut squash at 425˚ until tender, 40-50 minutes depending on size. Remove and scoop out the squash. Alternatively, peel and cube butternut squash. Bring a pot of water to a boil and add butternut squash. Boil until tender and mash. Squash: In terms of squash, butternut works the best as acorn or spaghetti tends me not be as creamy when pureed. However, sweet potatoes or even pumpkin puree would work. Cheese: Blue cheese can be a bit strong and instead I’ll use goat cheese, smoked mozzarella, or even gouda. Greens: Since the butternut squash is the base, try adding more vegetables or greens to the top before adding the cheese. Spinach is my top choice for adding to this pizza. I always feel just a bit better after spending 20 minutes in the sun! I’ve also had to be careful with iron intake as anemia has popped up in the past. I can’t wait until it is a bit warmer so I can just sit outside! 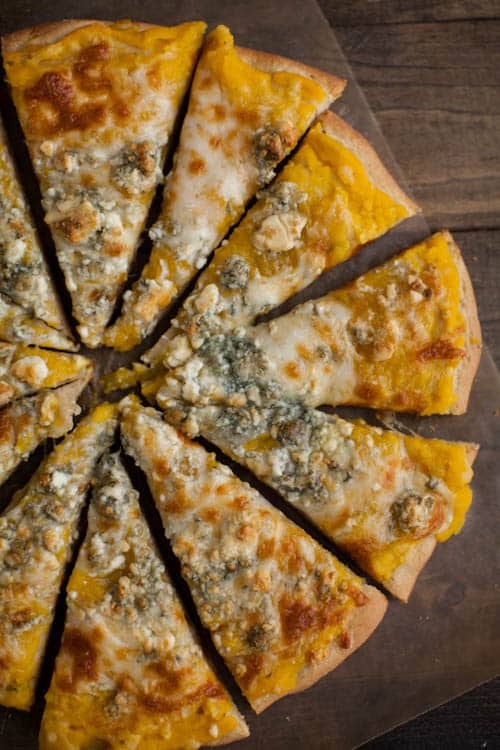 I love blue cheese on pizza but have never tried butternut squash and it sounds awesome. Pinned! Ha, I feel the same way about deadlines. Before a deadline was always the best. Two things: 1) You are literally the most productive person I have ever met, and I think about that often while we’re in the midst of this cookbook thing, so while I have full confidence that your napping days still put mine to shame, I will admit it comforts me a little that you are ever tired, hahaha! 2) SUNSHINE HOW I MISS YOU! Tim and I regularly talk about the need to move to California… oh, how I wish! Soak up extra warm weather for me, okay? It’s crazy how much the sun helps. Your new routine of taking time out of your day to walk / bike sounds wonderful! I literally have probably not seen the sun in 2 weeks here in the midwest. And below freezing temperatures are making me so insanely stir crazy for a bike ride. Oh, and this pizza looks like the best new pizza combo I’ve seen in a long time! Oh gosh, I’ve been following along! I have to say that the freezing weather is one thing I don’t miss about being in Illinois. I’ll send some warm sunshine thoughts your way! Umm… YUM. I just made a butternut squash sauce for pasta, but I never thought to put it on pizza! Such a great idea!! OMG, this looks sooooo good! I love the idea of the squash and the blue cheese together. Especially when baked together as a pizza! Awesome! I take vitamin D supplements because here in the northeast the sun just doesn’t give you direct enough light to make vitamin D…but I can definitely tell when I skip a few doses! It’s crazy. I kind of want to drink this sauce! Such a perfect pizza sauce. I am not sure if it’s true or not, but I’ve heard that the prevalence of Vitamin D deficiency in sunny climates like California and where I live in Western Australia is huge. Most of it comes from being more aware of skin cancer. My husband works outside all day in the sun and was diagnosed with a deficiency. Afternoon BBQs with things like this pizza help! I’ll definitely be trying this! We just made a similar pizza to this! I love using squash puree as pizza sauce. We added some kale but otherwise our pizzas are twins. Delicious. During the farm season i always feel like there aren’t enough hours in the day, during the winter I feel like the days are too long. I guess the grass is always greener eh? I was also vitamin D deficient a few years ago. I also live in California but then, I am not big on being outdoors. I found that once I began taking vitamin D regularly (which I now do EVERY day without fail) I not only had more energy, I also got sick much, much less often. Before vitamin D supplementation, I was sick multiple times every year, and it took a long time to kick the illnesses. Vitamin D is a miracle as far as I am concerned. Glad you had it diagnosed and getting it taken care of! So good to hear taking the supplement- I started on it right away! I am currently obsessed with all things squash/sweet potato, so this is right up my alley! Now if I could just get my husband to enjoy it so much, I wouldn’t have to make two different pizzas! I wish I had onions in the house when I made this- I think some caramelized onions would be an amazing addition! this was so good! I used agave nectar instead of honey. I love using squash puree as pizza sauce! So good that I tried to inhale it out of the oven and now have a blister to prove it. Great flavor combos with the bleu cheese and squash. I didn’t have rosemary so I used thyme. I cooked the squash in the slow cooker. Just cut the squash in half and put it in the slow cooker with 1/2 a cup of water and cook on high for 3 hours. I used the slow cooker for the pumpkin puree too. Thanks! Incredibly delicious pizza! I made it for my husband BDay and everyone loved it and talked about it. Complete succes! I have never left a review before, but today I must!! This pizza was absolutely amazing! It is so different and simple, yet full of flavor! I am obsessed! A friend just turned me on to your blog, and I can’t wait to try out more recipes!! Thank you for being so kind and sharing your talents!